Lead nurturing process in business-to-business world is as important as generating new leads. The marketing follow ups that converts requests in to leads and leads to sales is known as lead nurturing. This process makes a very strong relationship with the prospective clients. Automated lead nurturing CRMs are available to do all these follow ups for you. 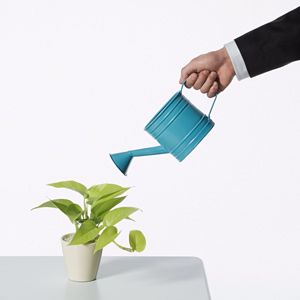 Actually lead nurturing becomes vital whenever there is a delayed sales. So for automating this very important part of a sales cycle, businesses should opt for an advanced lead nurturing CRM. Your lead nurturing CRM should help you out in making timely conversations with your prospects. The main aim of lead nurturing process should be educating your prospects on a regular basis. Your lead nurturing CRM not only 'get in touch' with the prospects but also should be able to capture their contact details and data points like interest to buy, buying stage etc. Analysis phase of your lead nurturing automation process is also very important as to make out which prospect is engaged with your automated follow ups and who all would become a part of your client base in the future. CueSent can help you go from a mere interest by a prospect to lead closure in your marketing automation process. 2. Don’t focus nurturing content on your product; rather, focus content on what your product does for your prospect.Communicate your message using 3rd party content, case studies, white papers, eBooks, Podcasts, webinars and tradeshows invitations.